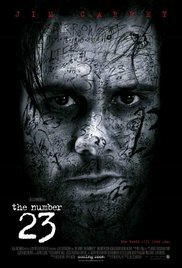 The plot involves an obsession with the 23 enigma, which is the idea that all incidents and events are directly connected to the number 23, or to some number connected to 23. Walter Sparrow (Jim Carrey) is an Animal Control Officer and married to Agatha (Virginia Madsen); they have a son, Robin (Logan Lerman). At a bookstore, Agatha begins looking at a book titled The Number 23 written by Topsy Kretts. She later gives Walter the book as a birthday present. Read more on Wikipedia.